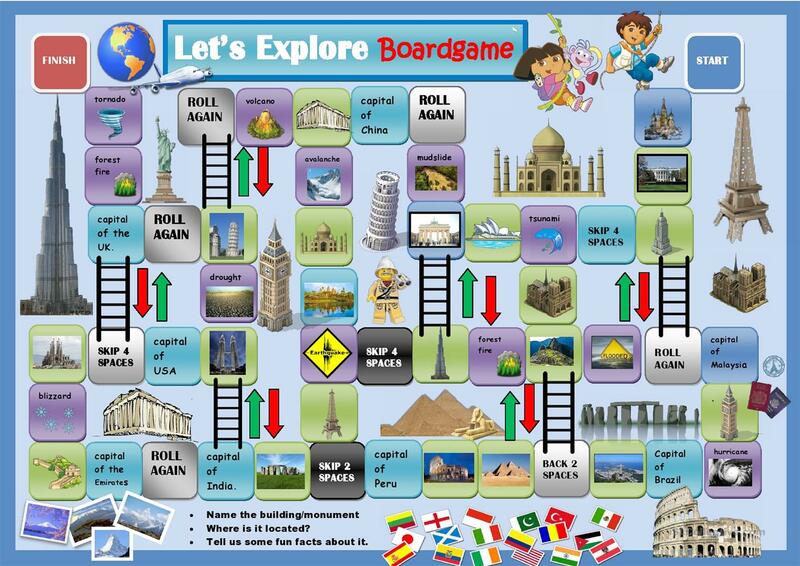 A game that includes famous monuments, common disasters, and world capitals. Students should prepare before playing by studying the FAMOUS LANDMARKS and DISASTER CARDS. When the player lands on a square, he/she needs to explain about the landmark or disaster or provide a world capital. If the player cannot, then he/she loses a turn. You can move in any way around the board until you reach the finish line. This game was inspired by a student who is a geography nut. This downloadable worksheet is a great resource for high school students, elementary school students, adults and students with special educational needs, learning difficulties, e.g. dyslexia at Pre-intermediate (A2) and Intermediate (B1) level. It is a valuable material for working on your groups' Speaking skills. It is about the vocabulary topic of Countries, Environment, Places and Travel.